Electric Cars Hit Record In Norway, Making Up Nearly 60 Percent Of Sales In March Tesla's Model 3 is giving a jolt to Norway's car market. Also in play: Norway's lucrative incentives for owners of electric vehicles. 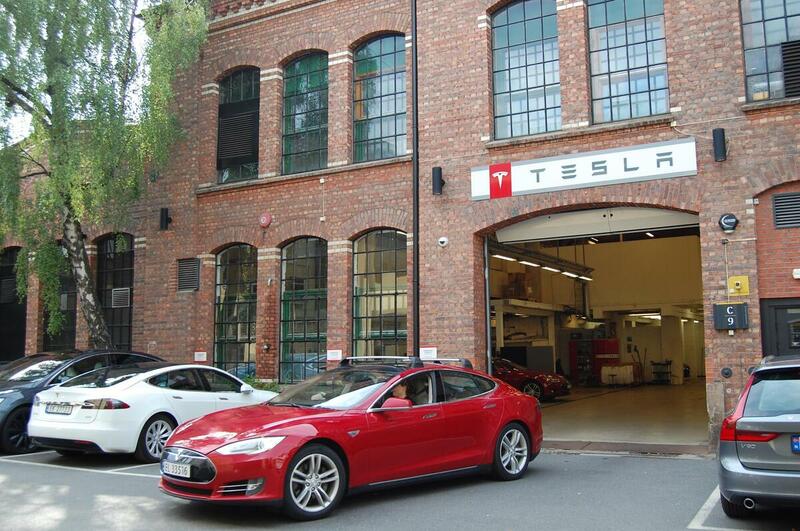 A Tesla Model S electric car leaves a service center in Oslo, Norway, in 2018. Electric vehicles are now the norm in Norway when it comes to new car sales, accounting for 58 percent of all car sales in March. Tesla's mass market Model 3 was especially popular, accounting for nearly 30 percent of new passenger vehicle sales, the Norwegian Information Council for Road Traffic, or OFV, says. The figures reflect Norway's desire to move away from fossil-fuel vehicles — with help from lucrative government incentives for owners of electric vehicles. Overall, 18,375 new passenger cars were registered in Norway last month, the OFV says. Of those vehicles, 10,732 were rated with zero emissions — a gain of about 100 percent from the previous March. And nearly all of those vehicles are electric (four are hydrogen-powered). Norwegian car buyers registered more than 5,300 Tesla Model 3 sedans in March — a record for a single car model in one month, the OFV says. In that same period, no other carmaker had more than 10 percent of sales. In addition to the all-electric vehicles, 3,469 new hybrid cars were sold, reflecting a 10 percent drop from March 2018. As Reuters reports, "In 2018, Norway's fully electric car sales rose to a record 31.2 percent market share from 20.8 percent in 2017, far ahead of any other nation, and buyers had to wait as producers struggled to keep up with demand." Norway is well-positioned to reduce carbon emissions by a transition to electric vehicles. For one thing, it draws nearly all of its electricity from a network of hydroelectric power plants, according to its government. Hydroelectric power is cleaner than electricity powered by coal or natural gas. On average, Norwegians are among the richest people in the world, meaning many of the country's citizens can afford a new electric car. In the 25-year period from 1992 to 2017, Norway's gross national income per capita more than tripled to nearly $64,000, according to the World Bank. And then there are the incentives. For years, Norwegians who opted for a zero-emissions car enjoyed a wealth of benefits, including an exemption from sales, import and road taxes. Until recently, emissions-free vehicles could also be parked for free and were immune to all toll and ferry charges. Those policies have changed, but owners of electric and other zero-emissions cars still face only up to 50 percent of the going rate for tolls and parking. There is a paradox in Norway's rush to become a green power pioneer. It is a significant producer and supplier of fossil fuels to the global market, and the country's wealth has been boosted by its rich energy reserves: Norway is one of the world's largest exporters of natural gas. The U.S. hasn't embraced electric vehicles with the same enthusiasm as Norway. But sales are picking up. The industry site InsideEVs reports that they hit a new high in 2018, with 361,307 vehicles sold — a sharp rise from 2017's tally of 199,826 vehicles. But with persistently low gas prices, many Americans see no financial reason to make the switch to an electric vehicle. And U.S. consumers also have concerns about going electric, such as the availability of charging stations. Looking at the broader picture, Wards Automotive notes, "of the 17.215 million light vehicles sold in the U.S. in 2018, 16.042 million of them had just a traditional gasoline-powered internal-combustion engine. Another 496,000 had diesel engines in 2018, leaving 677,000 alternative-powertrain models sold." But the U.S. electric vehicle market does have at least one thing in common with Norway: nearly all of the recent U.S. gains can be attributed to Tesla and its new Model 3. In 2018, Norway was an important market for U.S. exports of new cars and light trucks, with more than $821 million in sales — representing the 10th-largest market by dollar amount, according to the U.S. International Trade Administration. Because of incorrect information from the Reuters news agency, the caption with a previous photo on this page misstated the location of the Tesla dealership.